Yes, much excitement at the reservoir today. 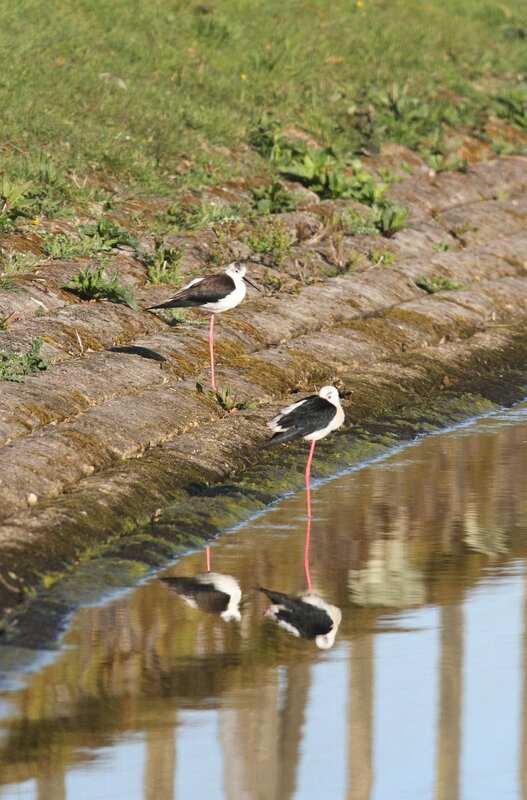 It seems we had as guests a pair of Black Winged Stilts, which are not, as you might think, a Foiler Moth with black cloth on the trampolines, but some rather eccentric wading birds. One of the bird watchers gave me a quick peek through his telescope, and they are quite pretty things. Amazing legs. Anyway, we managed to avoid disturbing them for long enough to give the flock of birdwatchers a good view, and proceeded to race. I suppose it was a good Force 1 pushing F2 a lot of the time, but it did rather die on the last lap, which was perhaps a step too far. Course was beat, shortish beam reach, long broad reach, short close reach back to the start. The first start was pretty congested at the committee boat end, which was probably favoured. Middle to right probably paid up the first beat, which unfortunately wasn't where I went. The second start was marked by a pair of guns, and it was Mike Curtis who had to return. This left Gareth Griffiths with something of a free pass, and he took advantage in the Aero to be the first of the fast boats through, with Andy Barnett next in the RS200. I think Mike Curtis didn't get into the lead until sometime towards the end of the second lap. I seemed to spend most of the race encumbered by a generous supply of Lasers, which is a good thing for the series, if not for my race place or my race awareness. We had 24 boats out last night, and 30 entries for the series so far, which is a good start. Spare a thought for Dave Baldwin, who wasn't quite clear on start times, and started two minutes late. We haven't maybe publicised this as well as we might, but for future reference this year the split is at 1060, with National 12s in the first start and RS200s in the second one. Results are here. Gareth tookk the win, followed by Andy Barnett. Mike Curtis came back to 3rd. Evan Cairns was 4th in a Solo, Kevin Pearson 5th in his Laser, and Paul Playle 6th in another Solo. 5 classes in the top 6. Personal Handicap went to Kiyo and Tom in the 29er. See I said there would be better nights for it. Andy Barnett was 2nd, then, provisionally, Rory O'Brien and Andrew Jones in Lasers, Gareth 5th and Mike Barrett 6th in another Laser. This is dependant a bit on whether the personal handicap bands I picked for the Laser sailors stick as discussed last week. I haven't mentioned food yet. I should mention food. Last night we had a choice of Pasta Bake or Shepherds pie, with garlic bread and various vegetables, supplied by Yin and Kate. Many thanks for your efforts.